Because there can be a great deal of disability resulting from poor repair of upper extremity injuries, there has been an increase in specialists who just deal with the upper extremity and hand. Specialized repair of upper extremity injuries involves the management of bony injuries, nerve repair, soft tissue injuries, and repair of blood vessels. Upper extremity injuries can be high energy injuries (such as is in a car accident) or low energy injuries (such as is seen in a simple fall). For example, a distal radial fracture of the forearm can be from an elderly woman falling on the outstretched hand or from a young person suffering from a high energy car accident. While both sustain distal radial fractures, the mechanisms of injury are very different, and the treatment is different as well. The doctor or EMTs should get as much information as possible as to the mechanism of injury involved in the trauma. The injury can be from blunt trauma, penetrating trauma, lacerations, shear forces, crush injuries, or degloving injuries. They must determine if the environment was clean or contaminated, the dominance of the hand, and whether or not the injury was work-related. The initial examination of an upper extremity injury involves looking at the soft tissue, blood vessels, and nerves before looking at the bony injuries. Circulation can be assessed by looking at the color of the skin and the temperature of the skin. The rate of capillary refill is essential as well and is evaluated by putting pressure on the nails and seeing how fast the blood rushes back to the fingernails. If the vein is injured, the arm will be purple and swollen from a lack of blood returning to the body from the injured vein. The above areas can be checked to see if there is an injury to the affected nerve. Light touch perception can be evaluated along with doing two-point discrimination testing, in which the individual is asked whether just one or two areas on the fingertips have been touched using a paper clip. The movement of the hands should be assessed as well to make sure no nerves or muscles have been affected. X-ray evaluation is usually a front and side view of the area that hurts. 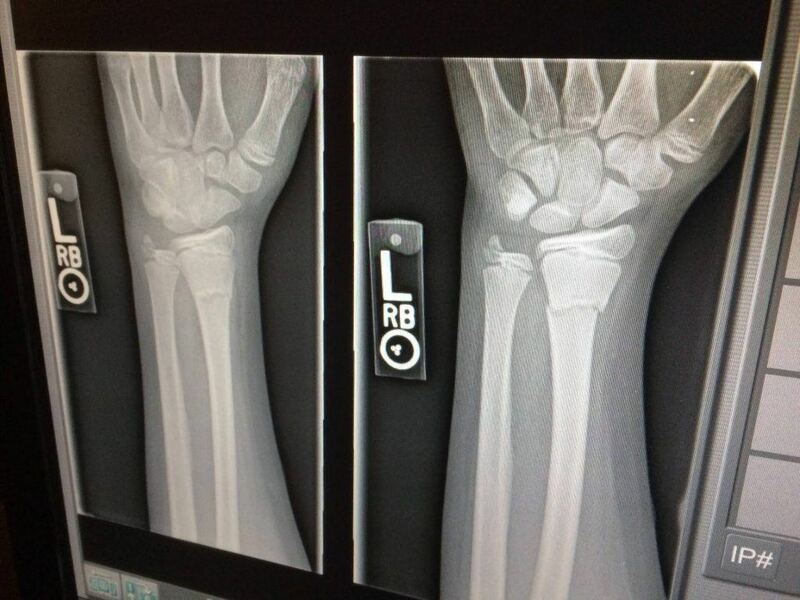 It is important to get the fractured area as well as an x-ray picture of the joint above and below the injured area. CT scanning and MRI scanning are used to plan surgery on the hand and arm but aren’t good for screening for fractures. There are several important injuries to the upper extremities that shouldn’t be missed. The first is “compartment syndrome.” This is when the swelling gets so big that it cuts off the circulation to the part of the arm distal to the swelling. It can result in gangrene of the hand if not treated properly. The other injury is called the “fight bite.” This is a laceration of the knuckles caused by being in a fight and striking someone else in the mouth. It has a high risk of getting infected, resulting in an infection in the knuckle joint or inside a fracture. There can even be the presence of a retained tooth inside the injury. This should be treated with surgery and with treatment that involves antibiotics covering for staph infections. Dead tissue needs to be removed when dealing with soft tissue injuries. Open injuries should be irrigated under pressure. 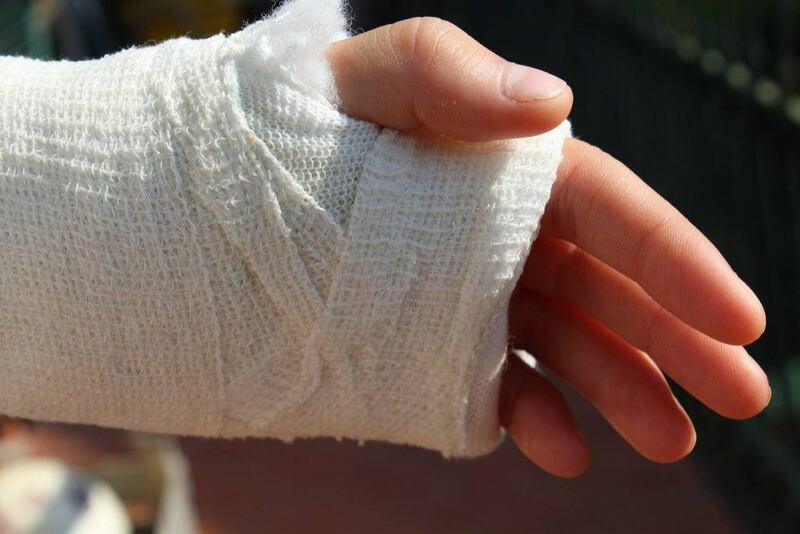 Some injuries can be repaired right away, while others require a delayed closure to prevent a breakdown of the wound that might become infected if repaired right away. The arm injury may need to be reconstructed if there is missing tissue or the need to reconstruct the bone, tendon, or nerve as well as the soft tissue. Skin grafting may be necessary if the wound covers a big surface area. Flap repairs using a flap of tissue near the injury can be used in large injuries as well. There are extensor tendons and flexor tendons. Extensor tendons are on the backside of the forearm and hand. Extensor tendons are on the palm side of the hand and forearm. Repair of extensor tendons needs to happen if the tendon is lacerated or if it pulls away from the bone. Without repair of tendons, especially of the hand, the person cannot straighten out part of their fingers, and this leads to disability. The thumb especially needs to be able to extend fully. Several tendons are involved in the extension of the thumb. If the wrist is slashed, there can be a lot of bleeding but, because of other areas of circulation, the circulation to the hand is usually not compromised. The wrist can be treated with a tourniquet and later a pressure dressing to stop the bleeding long enough to do surgery on the wrist. The repair of this injury goes from deep to the most superficial injuries. Tendon repair is usually followed by microscopic nerve repair. After repair, a splint is applied until the tendons heal. If the tip of the finger is fractured, the distal bone may need to be wired to hold the bone together. If the fracture is open, antibiotics must be used. If the nailbed has a blood clot beneath it, it must be evacuated by putting a hole in the nail, allowing the nail blood to drain. If the nail is split, it must be removed so the nail bed underneath it can be repaired. After repair of the nail bed, the nail may be replaced to allow for the new nail to grow without the nail fold closing up. The nail also splints the fractured area at the tip of the finger. If the palm side of the fingertip is lacerated without bony exposure, it can be treated with soaks and dressings and will heal well. A skin graft may need to be applied with larger areas of skin lost. If the bone is exposed, a flap graft is necessary. Amputation may need to be done if a flap repair is not possible. If the fingertip is partially amputated, it may be sewn back on. This is especially true of the thumb, which needs all the length it can get. If the fingertip is completely amputated, the tip of the finger may need to be repaired so the jagged edges of the amputation can be removed and sewn together. 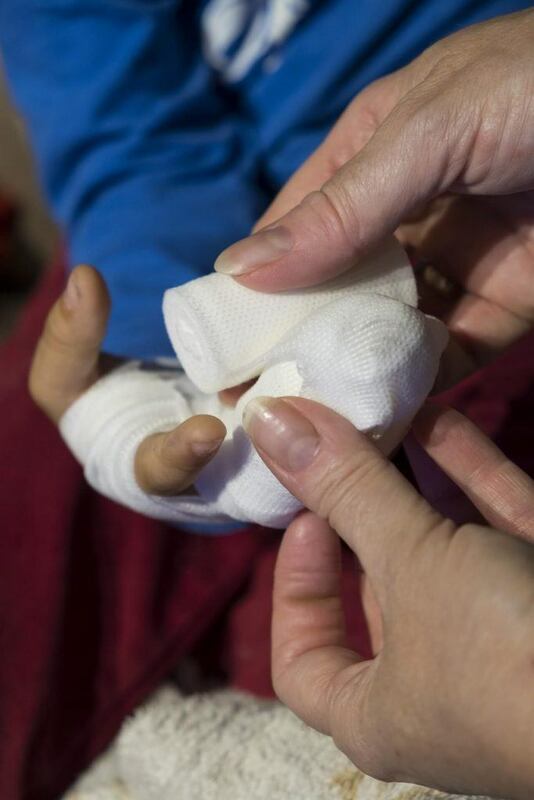 Frostbite is treated by rapidly rewarming the hand with active hand therapy used. Blood thinners can be used to prevent having to amputate too much of the hand or fingers. Amputation does not have to be done right away because the actual level of amputation necessary may not be clear for several months. After rewarming the hand, white blisters can be opened up, and aloe vera applied. Blisters that have blood underneath are left the way they are with aloe vera applied. Tetanus, antibiotics, and ibuprofen are used to prevent infection and blood clotting in the frostbitten area. Chemical burns need to be copiously irrigated to remove all traces of the chemical. After that, they may be treated similarly to regular burns. Electrical injuries are common in the upper extremity because people often touch the electrical source with their fingers and hands. High energy electrical burns can be devastating, with swelling that results in compartment syndrome. There is usually a lot of muscle destruction with loss of muscle proteins that can back up in the kidneys, resulting in kidney failure. In severe cases, electrical burns require amputation of the extremity. Thermal burns involve cooling of the burned area in cool water. 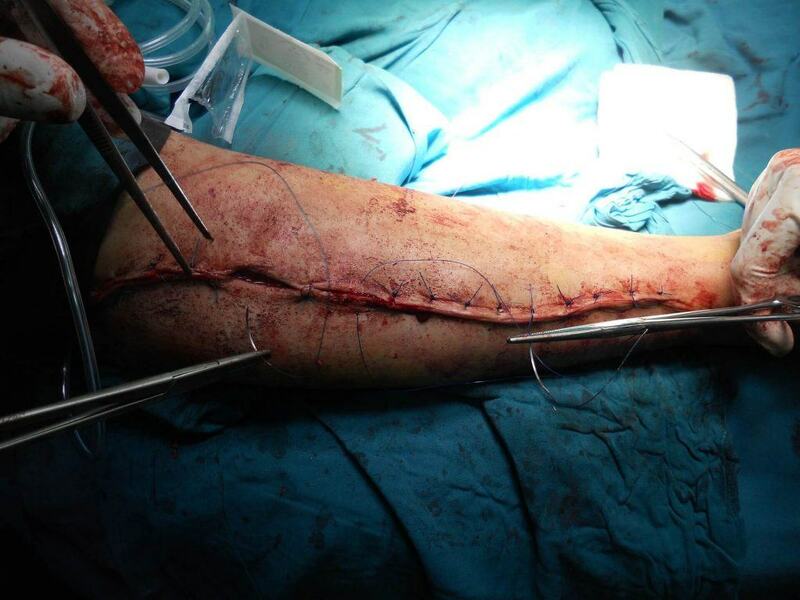 If there is severe swelling of the extremity, cuts must be placed in the skin to prevent compartment syndrome. The cuts, called a fasciotomy will allow fluid and swollen muscles to swell outside of the body. The cuts are then sealed when the swelling goes down. The treatment of the burn depends on the depth of the burn. Grafting may be required for full thickness burns. Custom-fitted elastic garments are worn on the hand and arm to prevent the scars from getting too large. Infection is a common occurrence in hand injuries with most organisms coming from puncture wounds, bites, open fractures or lacerations. Most infections are caused by Strep or Staph organisms. The exam will show redness, warmth, and swelling of the hand. The disease can spread up the arm through the lymph vessels. Some areas need to be drained of infection due to abscess formation. The most common injuries to the hand are of the nail fold. Soaks in warm, soapy water and antibiotics are indicated with surgery to drain any small abscesses. A felon is an infection of the pulp of the fingertip. This must be drained to prevent liquefaction of the fat in the pulp of the finger that will make the tip of the finger disfigured. Treatment with antibiotics alone rarely works. The hand itself can become infected and can lead to damage to tendons if not healed properly. Bite wounds from cats or dogs are often the source of these kinds of infections. Preventative antibiotics should be used in any type of bite wound to prevent infections. Common injuries to joints include those that connect the clavicle to the sternum, the scapula to the chest wall, a shoulder separation, the ball and socket joint of the shoulder, and the elbow. These can be just dislocated or can be dislocated and fractured. Dislocations may be treated by putting the bones back in the proper position, while fracture/dislocations often need surgery to correct the fractured areas. Dislocations of the wrist are rare but are hard to treat. Finger dislocations can be addressed by putting traction on the finger to allow the joint to pop back into place. Bony fractures to the upper extremity can be treated with casting or surgery. Plates and screws can be used in those fractures that don’t heal well by means of casting alone. The entire arm or the fingers can be reattached if they haven’t suffered from a long period of a lack of blood flow to the affected areas. The fingers or arm that has been amputated can be cooled to just above freezing to stop the damage to the amputation so that it has a better chance of recovery. Individual fingers are better reattached than parts of the hand or the upper arm. If reattachment is not able to occur, amputation is necessary. Watch YouTube Video: Orthopaedic Surgical Treatments for Upper Extremity Injuries. In the video below, Dr. Bryson Lesniak discusses the different surgical treatment options for arms and upper extremity injuries. I’m Ed Smith, a Sacramento Personal Injury Lawyer. Call me anytime at 916.921.6400 or 800.404.5400 for free, friendly advice.